Narrating a story, Michelangelo reveals just why he insists on being the light-hearted prankster even in the direst of situations. The story sees a small turtle shuffling into a Wild West saloon. After much effort, the turtle makes his way to the bar and asks the bartender for some turtle food. Enraged, the bartender informs him they don’t serve turtle food and tells him to leave. The turtle leaves. The very next day, the turtle returns. Just as last time, he slowly shuffles to the bar and asks the bartender for some turtle food. Even angrier now, the bartender tells him they don’t serve turtle food and if he comes back again he’ll nail his shell to the floor. The turtle leaves. 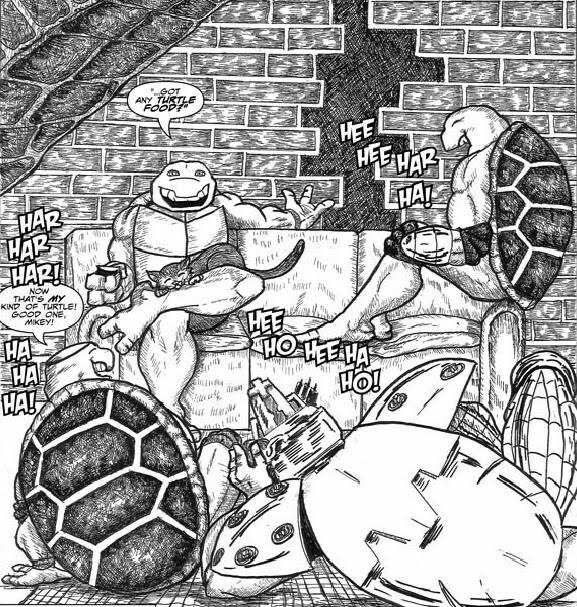 Back in the sewer, Don (who is a cyborg), Raph (wearing an eye-patch) and Leo (missing his left hand) all laugh heartily at Mike’s joke. Mike’s inner monologue reveals that he plays the part of the comic relief because humor lightens tense situations and a good laugh promotes peace and unity. Being a peaceful kind of guy, he sees comedy as the path of least resistance and as long as he can make the world smile, then there’s a little less to fight over. 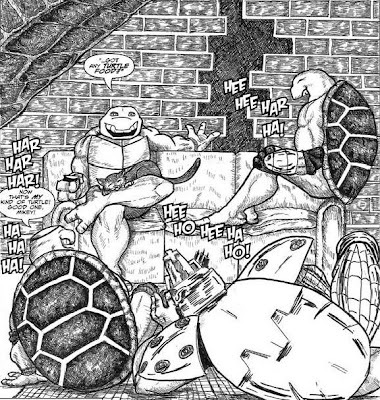 *With all four Turtles together, and Leo missing his left hand, I would place this story in-between TMNT (Vol. 3) #23 and TMNT (Vol. 3) #24. *“Practical Jokes” was originally sold to Mirage Studios by Will Tupper to be a back-up comic in Tales of the TMNT (Vol. 2). Mirage opted not to print the story after purchasing it before Tales of the TMNT (Vol. 2) was cancelled. 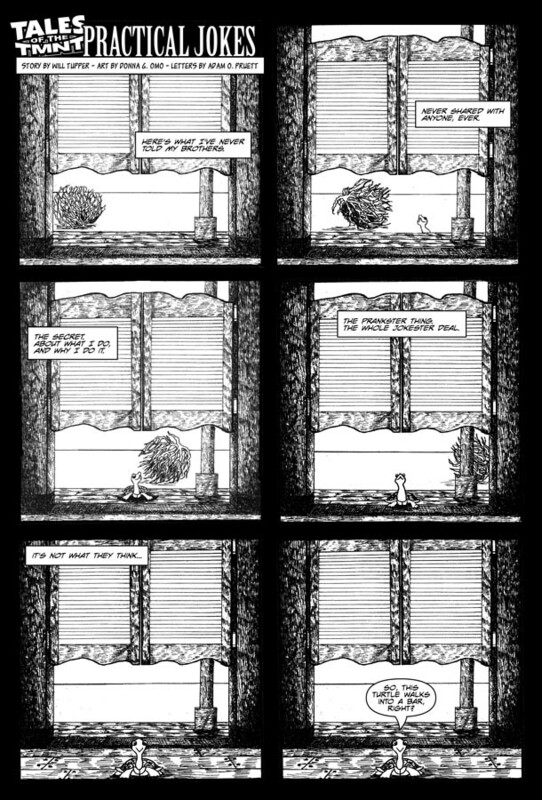 The art and letters for the story were eventually completed by Donna G. Omo and Adam O. Pruett in August of 2010 and the story was made available online via The Technodrome Forums (you can view it here). *Less than a year later, Andrew Modeen printed the story in TMNT (Vol. 3) #24 as a back-up in that publication. *The other installments in Tupper's vignette series are "Credo", "Secret Spirit", "The Mother of All Anger", "Fathers and Daughters" and "Conflict Resolution". Prior to “Practical Jokes”, author Will Tupper had been doing a series of introspective back-up stories focusing on one individual Turtle (and Casey), giving us insight into how they view themselves and why they behave the way they do. Oddly, by the conclusion of Tales of the TMNT (Vol. 2), Mikey never got his story. As it turns out, for reasons unknown, Mirage opted to publish all of Tupper’s back-ups save that one, leaving the series incomplete. Rather than let it go to waste, we’ve gotten to see it via the internet and the self-publication of TMNT (Vol. 3) #24. Hooray for the fans! While I wouldn’t qualify the joke as a major knee-slapper, the implementation of the narrative as basically a stand-up routine suits Mikey and the point of his inner monologue perfectly. Mikey has always been my least favorite Turtle, as his comedy relief antics are often more obnoxious than genuinely amusing, but stories like this and Tales of the TMNT (Vol. 2) #64 go a long way in turning him around. The hard part with “comedy relief” characters is that they have to be funny. All the time. No one can be funny all the time and a nonstop barrage of bad jokes and useless slapstick is not the way to endear a character to the audience. Lesser writers tend to treat Mikey that way, so stories like this almost feel akin to “damage control”, where an author tries to explain to us why Mikey acts like a doofus and rarely pulls his weight. While it’s up to each individual reader whether they “buy it” or not, the effort is appreciated and, at least in the case of “Practical Jokes”, Mikey’s rationalization of his behavior makes sense to his character and world view. Donna G. Omo’s art is very cute and stylish, with the scenes in the Old West really looking like something out of a dime novel or a pre-photograph newspaper. It’s only six pages long, but I found myself flipping back and digesting each panel a couple of times, as Omo slips in lots of fun details, such as two cowboys fighting over a girl in the background or a liquor shelf full of brands with “familiar” labels (“Farley’s Finest”, “Fosco’s Fizz”, “Eastman’s Distillery”, “Carlson’s Stout Ale”, etc.). The last page sees the Turtles in their various forms from toward the end of Image’s TMNT series, which I doubt was in the original script sold to Mirage (as Mirage’s decree at the time was that Image’s TMNT was non-canon). It still makes for a nice compliment to Mikey’s story, as that particular year in their lives was one of their hardest, making the need for laughter all the greater. 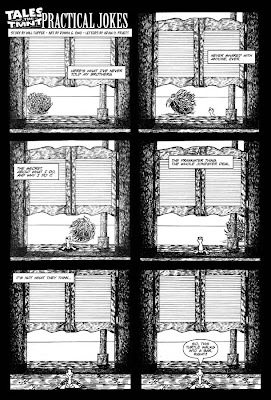 Pruett’s letters deserve some cred, too, particularly the way he has Mikey’s narration coming from the little turtle through the whole joke, rather than in little boxes in the corner of each panel. It helps give the joke a better “voice”, as you can imagine in your head Mikey trying to sound like a little turtle or a gruff bartender when he delivers each of their lines. “Practical Jokes” was a nice finish to Tupper’s series of back-ups, and if you add them all together, you basically end up with a graphic novel’s worth of material in the vein of Michael Dooney’s “Challenges”. Not a bad piece of work. Great review, Mark. I never really thought about the significance of speech bubbles vs. dialogue boxes, but you make a really good point about how it enhances the story. Are you going to do the other back up stories too? Yep. I'll see if I can get to them tomorrow. Thanks for the thoughtful review! I agree with you, too. It would be great if Will could get a compilation of his shorts published in à la Dooney's "Challenges".